ome of these days when you are learning about countries, mountains, and rivers, you may like to know that a minister by the name of Morse was called the Father of American Geography. He wrote all the first geographies used. Some were hard, others much easier. But whatever he wrote, he had to have the house very quiet. Between the sermons he had to get ready for Sundays and the books he had to make for schools, he was nearly always writing in his study, so his little boy "Sammy" had been taught to tiptoe through the rooms and to be quiet with his toys. He could not remember the time when his mother was not whispering, with a warning finger held up, "Sh--Sh--Papa's writing!" Sammy liked to draw, especially faces! One day an old school-teacher had come to see his father about a geography. This man had a large, queer-shaped nose. Sammy wondered if he could draw a picture of it. He did not dare disturb any one by asking for paper and pencil, so he took a large pin and scratched a picture on his mother's best mahogany bureau. The scratches looked so like the man that Sammy clapped his hands and shouted with laughter. His mother came running to see what had happened and when she looked ready to cry and said: "Oh, Samuel Finley Breese Morse--what have you done?" he knew right away that something was wrong. She usually called him just Sammy. It was only when she was displeased that she used the whole long name. After this he was watched pretty closely until he went to school. Then he grew so fond of reading that there did not seem to be time for anything else. In school it was noticed that Samuel Morse had better lessons than most of the boys, and that when it came to questions in history or questions about pictures and artists, it was Samuel who was able to answer them. When he was fourteen, he wrote a life of a noted Greek scholar. It was not published, but it was very good. He also painted pictures in water colors of his home and portraits of all the family. These were so perfect that every one said he should go to Europe and study with the famous Benjamin West. Finally his parents agreed that this was the right thing for him to do, but they said he would have to live very simply, because the Morses were not rich. Samuel did not mind working hard, eating little, or dressing shabbily, if he could just study with a fine teacher. West noticed how willing Samuel was to do his pictures over and over again, so he took much pains with him. Samuel won several prizes and medals, and his pictures were talked of everywhere. Morse came back to Boston when he was twenty-four, poor and threadbare, but famous. People flocked to see his pictures but did not buy them. So he went to New York to try his luck in that city. From a little boy he had liked to try experiments with magnets and electricity, so he often went to lectures on electricity and thought about different things that might be done with such a force, if only people could learn how to use it. These lecturers that he heard often made the remark: "If only electricity could be made to write!" This sentence kept going through Samuel's head, as he sat at his easel, painting. It stayed in his mind when he went to Europe for the second time. It followed him aboard ship when he was returning from that second trip, sad and discouraged, because a big picture on which he had spent much time and money had not sold. Poor Samuel Morse felt like crying, but he said to himself: "Well, I won't sit by myself and sulk just because I have had more hard luck. I will be sociable and talk with the other passengers." It was fortunate he did, for a group of men were telling about some experiments they had seen in Paris with a magnet and electricity. Samuel asked some questions and then began to pace the deck and think. Pretty soon he took out a notebook from his pocket and began to make marks in it. He got more and more excited as the hours went by, for he knew he had thought of something wonderful. He had invented an alphabet for sending dispatches from one part of the world to another! When it was daylight, he had written out an alphabet of dots and dashes that stood for every letter and number in the English language! Morse expected others to be as pleased as he with his invention, but they did not even believe in it. "The idea," said they, "that a man in New York can talk with another in San Francisco!" Of course, if people did not believe Morse's idea was right, they naturally would not give any money to try it out, so for years this man almost starved while he lived in one small room that had to serve for work-shop, bedroom, kitchen, and artist's studio, while he took pupils, did small pictures, anything, in fact, to get money for his machine and to pay for his room and food. You see he needed one beautifully made machine, and he must have a long line of poles and wires built before he could prove that with his dots and dashes people could talk to each other, although they were miles apart. And this would cost a lot of money. He sent many letters to Washington, asking Congress to help him. The men in Congress were not interested. His letters were not answered. "Poor old chap," they laughed, "he's gone crazy over his scheme!" Finally, as no attention was paid to his letters, Mr. Morse saved up a little money and went to Washington himself. One senator agreed to ask Congress to advance him some money. But the time kept slipping by, and nothing was done. One night when it was late, and all the senators were eager to get through with bills and business, the senator who liked Mr. Morse saw him sitting away up in the gallery, all alone. He went up to him and said: "I know your bill (or request) will not pass. Oh, do give it up and go home!" When Mr. Morse went out of the building, he had given up all hopes of getting help. He went to his boarding-house, and when he had paid for the room and his breakfast the next morning, (he never ran in debt--for he had a horror of it!) he had just thirty-seven cents left in the world. After he had crept up the many flights of stairs, he shut the door of his small room and knelt down beside his bed. He told God that he was going to give up his invention--that perhaps it was not right for him to succeed. He had tried to do something which he thought would be a help in the world, and if he could not, he would try to be brave and sensible about it. Then, being very tired, he fell asleep like a tired child. But the next morning--what do you think?--a young lady, the daughter of the friendly senator, came rushing into the room where Mr. Morse was eating his breakfast, and holding out both hands, said joyfully: "I've come to congratulate you. Your bill has passed!" "It cannot be," he answered. "Oh, it is true. My father let me be the bearer of the good news." "Well," said Mr. Morse, trembling with delight, "you, my dear message-bearer, shall send the first message that ever goes across the wires." It did not take long to convince the world that Professor Morse (as he was now called) had invented a fine thing. In less than a year a line was completed from Washington to Baltimore, and Miss Ellsworth, the kind senator's daughter, sent the first message ever heard over a recording telegraph. People found it a great blessing to be able to send quick news, and Samuel Morse was soon called the greatest benefactor of the age. The man who had lived in one room and who had gone for two days at a time without food received so many invitations to banquets that he could not go to half of them. The ten powers of Europe held a special congress and sent the inventor eighty thousand dollars for a gift. The Sultan of Turkey, the King of Prussia, the Queen of Spain, the Emperor of the French, the King of Denmark, all sent decorations and presents. The name of Samuel F. B. Morse was on every lip. But all this success did not spoil him one bit. He was the same modest, lovable man he had always been. Very few Americans have had so much honor paid to them as he. When he was an old man, the telegraph people all over the world wanted to show their esteem for him and so erected a statue to his memory in Central Park, New York. An evening reception was held in a large hall, and when Samuel Morse came upon the stage, how the audience rose and cheered! 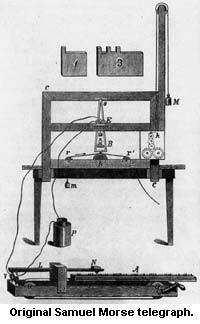 He was led to a table on which had been placed the first telegraph register ever used. In some clever way this had been joined to every telegraph wire in America and to those in foreign lands. Mr. Morse put his fingers on the keys, and after thanking his friends for their gift, spelled out, with his own dots and dashes, his farewell greeting; it was this--Glory to God in the highest, and on earth peace, good will toward men! When Jedediah Morse wrote his geographies of the United States, he little thought the small boy Samuel, who tried so hard not to disturb him, would one day bind all the countries on the globe together!